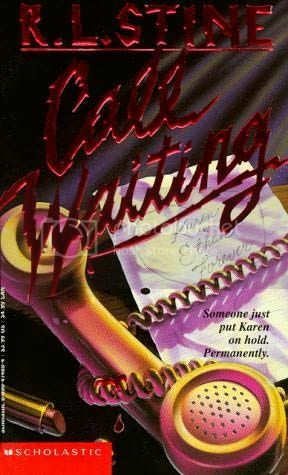 A killer who phones his victims before murdering them is stalking Karen, and if Karen cannot trace the caller, she will become his next conquest. I found a few of my old, young adult books while cleaning, so I'm going to give them a bash. It's quite a difference reading books which are so short, and with such massive text size! R.L. Stine was one of my favourites while growing up, first Goosebumps, then Point Horror as I 'matured'. It was interesting to read this one from an adult's perspective, but I was sad to discover I didn't enjoy it quite as much as I was expecting! To begin with, the entire story was incredibly predictable. I worked out about ten pages in who this 'phantom' caller was going to be, and the other little plot points weren't too difficult to fathom. This is a kid’s book, though, so I’m sure I can forgive this. Stine portrays his teenage characters quite well; I think he gets their feelings and actions spot on. In particular, Karen's crazy teenage girlfriend behaviour was quite accurate, and can be attributed to people in real life quite easily. For this reason, I didn't like Karen. She was a complete brat, very selfish, and cracked in the head. I didn't particularly like any of the characters; none of them were developed enough. I liked that the book was set in the 90s. It was so odd to read, especially as it's set around telephone calls and there were no mobile phones in those days. I also enjoyed the incredibly 90s Saved by the Bell patter that was peppered through the dialogue. Awesome! This definitely isn't R.L. Stine's best. There are many other Point Horrors he has written that have had me terrified. I think it may be down to the fact that there isn't anything supernatural going down in this one, just emotions and silly behaviours. It was enjoyable nonetheless and has inspired me to have a dig for the huge amount of others I had back in the day. Stay tuned for another R.L. Stine review! 32 / 72 books. 44% done!